EASY TO SPOT COLOR: Our orange TSA luggage locks were designed with security and durability in mind. The bright orange color makes it easy to spot the TSA padlock your luggage, suitcase, or backpack at the airport. 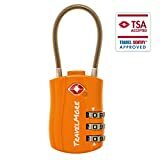 MULTI USE: This TSA luggage padlock can be used to secure a wide variety of items including to lock your luggage, suitcase, tool box, golf bag, backpack, gym padlock, etc.